The Michigan Fitness Foundation’s Governor’s Fitness Awards (GFA) nomination deadline has been extended to January 3, 2019. The GFAs honor inspirational individuals and organizations for their pursuit, commitment, and dedication to health and wellness. By extending the deadline, the GFA Committee offers Michigan residents and employers the unique opportunity to participate in the nomination process and to highlight their commitment to healthy lifestyles by recognizing individuals, events, organizations, and workplaces across the state. Accepting the Challenge – The Charles T. Kuntzleman Accepting the Challenge award recognizes individuals who have overcome extraordinary challenges to pursue a healthy and balanced life and who, in turn, serve as a role model for others. Help us honor those who have succeeded despite setbacks. Active Community – Imagine a community where people can walk or bike to work, to school, or to run errands. A place where families play together in parks and greenspaces and where neighbors wave to neighbors with a sense of connectedness and community pride. The Active Community Award is given to a community that creates this kind of vibrant, healthy environment. Active Senior – This award recognizes and honors our most seasoned citizens, those who keep moving and stay active even when it would be easier to take a shortcut. 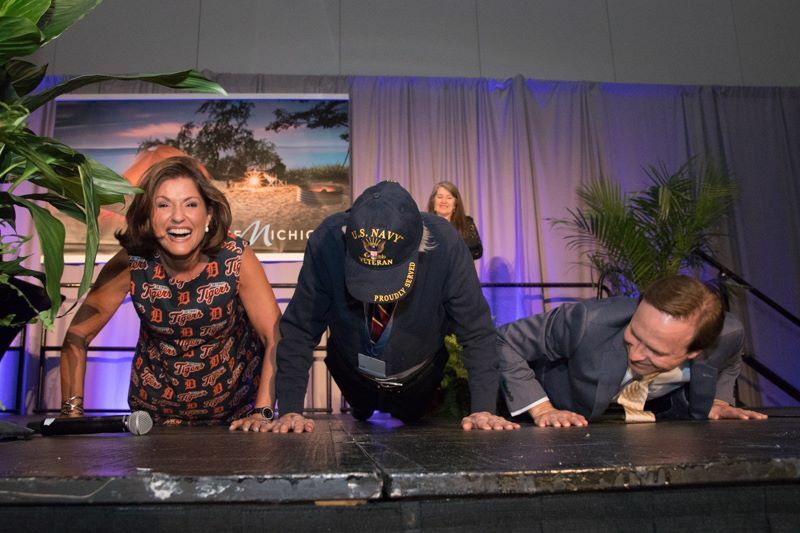 Help us honor active Michiganders by nominating someone who inspires you day in and day out through their determination to put one foot in front of the other, regardless of age. Conquering Obesity – Individuals recognized in this category have made the tough decision to lead a healthier life in order to overcome a health issue. They have dedicated themselves to finding balance in nutrition and physical activity in their daily lives. They lead by example, encourage others to make positive changes to improve their health, and continue to honor their own commitment on a daily basis. Director’s Champion for Health – The Michigan Department of Health and Human Services Director’s Champion for Health award acts to ignite and support positive community change, specifically encouraging physical activity and healthy eating across the lifespan. This champion works to develop programs, processes, messaging, and infrastructure in their community and shows how they have affected the lives and health outcomes in Michigan’s most vulnerable populations. Extraordinary Event or Organization – This award honors events and organizations who provide opportunities for Michiganders of all ages and skill levels to try different forms of activity, develop physical fitness skills, and gain a better understanding of health in a safe and welcoming environment. This honoree offers fun, safe, and innovative physical activity events or programs with no barriers for participation, creating a positive environment for all to pursue a physically active life. Healthy Workplace – Every year, Michigan work sites large and small take that extra step, spend the extra dollars, to develop innovative concepts which help create a healthier workplace — and consequently helps their employees to be fit, healthy, and more productive. To honor such efforts, the Governor’s Council on Physical Fitness, Health and Sports and the Michigan Fitness Foundation bestow the Healthy Workplace Award on organizations with outstanding programs that promote healthy living and create best practices for others throughout Michigan to emulate. To learn more about the awards, including past recipients and to nominate, visit our Governor’s Fitness Awards page.